Here's what I did for wheels for my 2001 325 CiC. My local dealer had these on sale a while back. 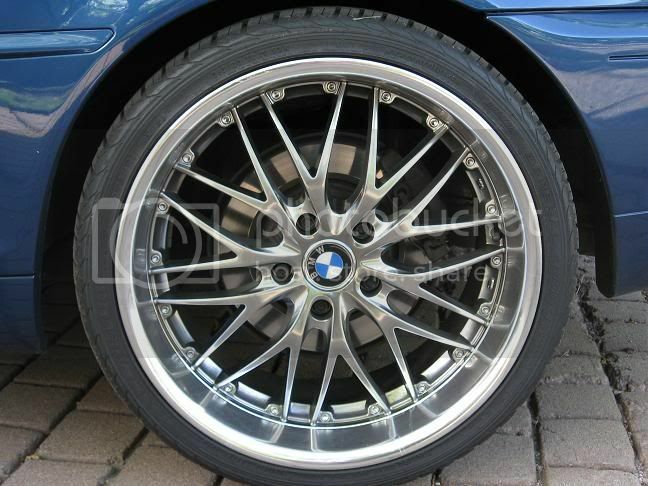 They're 18-inch 330 ZHP-type wheels - all same size. IMHO, they look better than the similar M-type wheels. Not only look great but going to the 18s improved handling remarkably with very little effect on ride! Zhp/135 wheels are nice indeed, and come staggered, I think 18x8 and 18x9. Can't remember the offset tho. If u do get CSL. Reps don't get silver, get hypersilver, it looks a quazillion times better. Some angles it will look silver, some anthracite, its crazy looking man. And don't be afraid to run a box setup vs staggered. Its cheaper for tire rotations, and it handles better. Since your looking a Velocity Motoring, be sure to look at, and consider the M6 reps, and LM reps.
Just wanted to post a pic of the wheels that came on my 2000 328ci I just bought. They look very similar to the CSL's but i do see a little difference. Anyways here is a closeup of the rear staggered wheel.